They call her “The Sauce Queen.” We call her Our Hero. Laurie Nielsen Neumayer, certified chile fan and Omaha, Nebraska resident, got in touch with The Chile Trail to share her recipe for Green Chile Sloppy Joes. Okay, let’s pause for a moment. Sloppy Joe + Green Chile + Velveeta = happiness. That’s why we’re pleased as punch to award Laurie the Golden Chile Award this week. Laurie’s been kind enough to share her recipe with us, her humble subjects. So get cookin’! Brown the hamburger and onion together, until both are well cooked, at least 15-20 minutes. I don’t drain the hamburger/onion mixture, but this depends upon the cook. Add the remaining ingredients and simmer together for 30–60 minutes. It will look very wet at first, but the liquid cooks off. The more this cooks, the better it is. Leftovers are really good in a burrito or taco. Place sloppy joe mixture on buns, top with sliced onions, Velveeta cheese and chopped green chile. Any idea how many restaurants close each year? No? That’s okay, neither did we. It’s a lot. Trust us, we googled it. Stats from the National Restaurant Association say 60% of restaurants close within the first three years of business. We have one word to say: depressing. So Beth Koch has a reason to smile. Heck, she’s got almost 26 reasons to smile because that’s how many years Zia Diner in Santa Fe, New Mexico has been going strong. Beth, a California native, moved to Santa Fe back in 1978. In ’89 she started working as manager of Zia Diner (“I was totally under-qualified for the job”), She’s been there ever since and now owns it. If she looks familiar you may have caught her on a segment of Diners, Drive-ins and Dives when Guy Fieri drove into town (Ian was one of the customers in that segment!). The menu is classic diner in the best sense of the word – comfort food like Burgers made from New Mexico grass-fed all natural chuck, Hot roast turkey plate with all the trimmings and a dessert menu with waist-expanding treats like Black midnight cake, Brownie sundaes and homemade pies that will knock your socks off. “I love all kinds of cooking by my first love is baking,” Beth says. You’ll also find some dishes definitely not found on most diner menus like Pecan baked Idaho ruby trout with citrus parsley butter and Organic curried coconut mussels. What’s next for Zia Diner? They’ve now running a successful catering business and added on a pastry shop as well. So stay tuned for the next 25 years! Beth shared a favorite bar-food treat at Zia Diner, their Zia Chipotle Popcorn. Kinda sweet, kinda spicy, kinda addictive. And kinda tastes even better when you get 25% off on Los Chileros popcorn, Cayenne, and Chipotle chile to make whipping up a batch even easier. But don’t hang around – we’re only being generous until Thursday, December 20th at midnight MST. Pop corn kernels in batches on stove or in microwave. Remove any burned or unpopped kernels. Place in large bowl with peanuts and mix. Mix all ingredients, except baking soda, together in a pan over low heat until melted. Bring to a boil and after 30 seconds remove from heat. Stir in the baking soda. Mixture will bubble. Stir into popcorn and nut mixture thoroughly. Divide mixture onto 2 large sheet pans lined with parchment. Bake in low 250 degree oven for 1 hour, stirring occasionally. Remove from oven and allow to cool, then break into pieces. 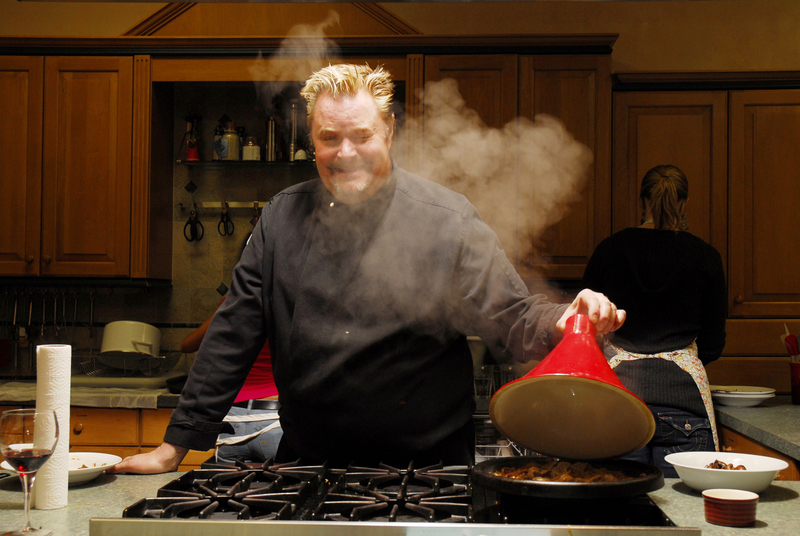 There’s something of the devil about Chef Johnny Vee. Just look at those impish eyebrows, that devilish goatee and the glint—yes the glint—in his eyes. Over the top? Maybe. But ask anyone who’s taken a class with him at Las Cosas Cooking School in Santa Fe, New Mexico and I’ll bet they’ll agree. Why? Because Johnny’s got a real passion for cooking. Sure he teaches classes like “Cut the Fat-Cut the Sugar-Cut the Carbs” but what’s he really saying? Add the butter, stir in the sugar and make mine a triple tortilla please. Food for him is about pleasure, enjoyment and above all else – fun. He’s been teaching at Las Cosas since 1999 and he’s put it on the map as the must-go destination for locals and tourists alike. “I’d say we attract about 70% locals and about 30% tourists,” he told me during a rare break from teaching. The school is located in the Las Cosas Cooking Shop, a treasure-trove for the foodie-minded, about a mile from the downtown Plaza. “When I started, most cooking schools only did demonstrations where you sat and watched the teacher. I disagreed. I like hands-on where the students do the cooking. It’s the best way to learn and definitely more fun.” Today he hosts classes that run the gamut from homegrown creations such as “New Mexico Favorites” to the far flung like “North Indian Street Food”. Before taking Santa Fe by storm, Chef Johnny Vee (short for Vollertsen) worked for top restaurants in New York City and launched a bunch of places in Australia, some with a southwestern theme. It was a move that would eventually take him to Santa Fe. 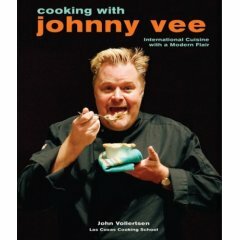 Now he’s here full time and just launched his first cook book, Cooking with Johnny Vee. It’s packed with loads of his favorites (check out the Eggplant Adovada—a vegetarian take on a southwestern classic) and a devilish good time (sorry, couldn’t resist). What is Chef Johnny’s full last name? Email answers to sales@loschileros.com by November 7th. Include your full name and address. We’ll pick one winner randomly from everyone who writes in. The winner will be announced next Friday in The Chile Trail. And if you don’t win, don’t sulk. You can buy a copy and Johnny will sign it for you (what a nice boy!). Just email him at: chefjohnnyee@aol.com. 1. Check salmon for pin bones and remove with needle-nose pliers or tweezers. 2. In a large, non-reactive, oblong pan, mix salt and sugar until well blended and spread it out into a shape that will facilitate the most contact to the salmon flesh. Sprinkle Caribe Chile over salt/sugar mixture. 3. 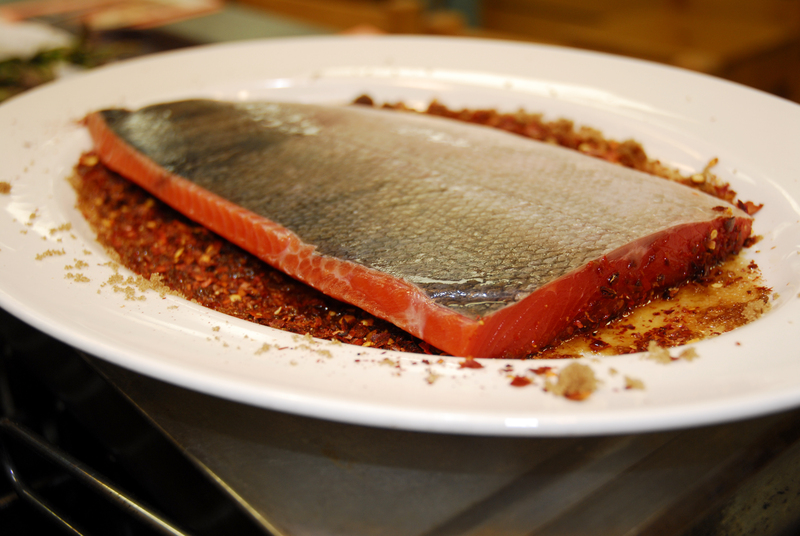 Season salmon with fresh ground pepper and lay it flesh side down, onto prepared cure mixture. 4. Cover with plastic wrap and place a similarly sized pan directly onto salmon. Weigh down pan with canned goods or brick and refrigerate for 24 hours. 5. Remove salmon from the marinade and gently scrape of a majority of the marinade. 6. Prepare the smoker and smoke salmon for 8-12 minutes, depending on the thickness of the flesh*, in a smoker using a mild wood (alder, apple, pecan, cherry). 7. Serve at room temperature with Hot Mustard Sauce. 8. Alternatively Salmon can be grilled over prepared fire. Place flesh side down and grill for 4 minutes then flip and finish skin side down. Grill until flesh comes away from the skin easily. Serve with Mustard Sauce. 1. Mix all ingredients together in a medium bowl and chill for one hour.